Like the west coast Wrecking Crew and the Motown-based Funk Brothers, Booker T and the MGs played behind countless hit records. Unlike those other units, however, Booker T and the MGs had an independent life as an instrumental group, performing and recording hit records of their own. They were also notable for being integrated, with two black and two white members – at a time with R&B acts were almost exclusively black. Hip Hug Her is from 1967, so I have given it a little bit of classic rock vibe to go with the funk. I have taken the audio from my two prior video posts and interleaved them with two more classic TV theme recordings (both too short to stand on their own, really) and combined them all into a “Cool Cats Medley”. See if you can identify the “cool cat” whose theme appears first and the show/”cool cat” whose theme appears after Peter Gunn and before James Bond. I don’t think this number needs any explanation or background. I doubt there are many people on the planet, regardless of when they were born, who do not recognize this iconic theme. So instead, a few words about production: There are three instruments here: guitar, bass and drums. I am not a drummer — that part is programmed and handled by EZ Drummer. I played the bass part myself and recorded it into ProTools. The, I play back those two tracks while I record the video and the guitar part. I then mix the audio and overlay it over top of the video. Peter Gunn was a private eye television series that aired from 1958 to 1961. The show’s creator was Blake Edwards, of “Pink Panther” fame. The title character, played by Craig Stevens, was an impossibly urbane, well-dressed private investigator whose hair was always in place and who loved jazz. 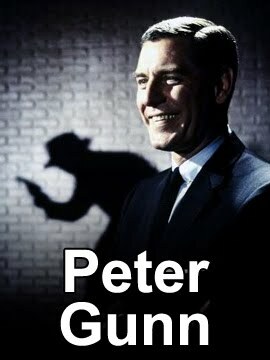 The series is probably best remembered today for its music, especially the popular “Peter Gunn Theme” presented here, which won an Emmy Award and two Grammys for Henry Mancini and subsequently has been performed and recorded by many jazz, rock, and blues musicians. Guitarist Duane Eddy’s version reached #27 on the Billboard Hot 100 in 1959. I have plans to record a couple more TV or movie themes, so stay tuned…. This is video #5 in the Old Guy Plays Oldies video series. The featured tune is Ferry Cross the Mersey, written by Gerry Marsden and a top ten hit for Gerry and the Pacemakers in 1965. This is one of my all time favorite songs ever.